With last weekends heavy rains and cold weather, there was nothing more perfect then a nice hot bowl of ramen for dinner. Having just attended a gallery opening on 17th and Mission, we made the short walk over to this awesome Izakaya/Ramen establishment on 16th and Guerrero. This relatively new place has gained a strong following amongst San Francisco ramen fans, and is one of the few Japanese places in the mission. A relatively small place with maybe enough room for 30 people the atmosphere is great with a modern Japanese feel and exposed kitchen. My choice for the night was their Rich Tonkotsu Ramen, Goku Spicy (their hottest offering), with sweet corn added as an extra (I see a theme forming). 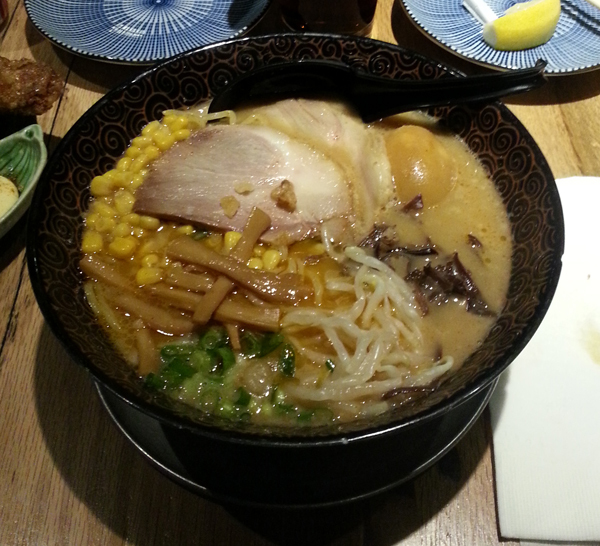 The nicely portioned bowl arrived with neatly arranged toppings and a wonderfully thick creamy broth. The Rich Tonkotsu Ramen consists of chāshū, boiled egg, bean, sprouts, kikurage mushrooms, house-made bamboo shoots, and green onions. First taste of the broth was heavy, very rich, and creamy with a perfect hint of salt. It had all of the makings of a fantastic tonkotsu broth, especially the trademark, and expected, floating fat globules common with the slow simmering of the pork bones. After the first few slurps the heat from the Goku Spicy level hit and was a perfect complement to the heavy broth. Even though they say its “hella spicy” I would say its on the medium-high side of the spice level. Certainly not hot enough to prevent finishing all of the broth after the noodles and toppings had disappeared. The noodles had just the right amount of firmness, and a nice mellow flavor that didn’t overtake the broth or toppings. Toppings were all fresh and crunchy, and the seasoned boiled egg perfectly cooked with just the right amount of runny delicious yolk. The chāshū was a bit on the fattier side then I prefer, and had a nice flavor but wasn’t the stand out of the dish by any means. It wasn’t bad, but it wasn’t the wow moment. I think the broth really took that award here. I think the chāshū is really the only thing keeping this dish from being a full 5 out of 5 for me. Being my second visit to Ramen Izakaya Goku, I can say they know their stuff and can serve a competent and fresh bowl of ramen that will please any true fan.